Amnesty International has described the arrest of popular musician and activist Pilato as a shocking demonstration of how far the Zambian government is prepared to go to strangle all criticism and crack down on freedom of expression. A bench warrant for Pilato’s arrest was issued on February 5 after he failed to appear in court on trumped up charges connected to his participation in a peaceful protest in September 2017. In a statement today, Amnesty International Regional Director for Southern Africa Deprose Muchena demanded the immediate release of the satirical singer, saying he is not a criminal. “The arrest of Pilato as soon as he arrived back on home soil is a shocking affront to justice. It shows the lengths to which Zambian authorities are prepared to go to stifle dissent,” said Muchena. 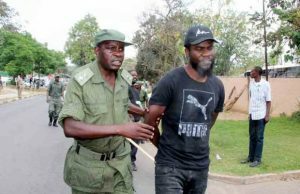 Pilato, whose real name is Chama Fumba, fled Zambia after receiving a video message in December 2017 in which supporters of the ruling PF threatened to beat him for releasing the song, which was a major hit. In it, he sings that the ruling elite are behaving like rats that steal food. The chairperson of the PF party for Central Province had ordered Pilato to stop singing the song on 11 December. Radio and TV stations were also ordered to stop playing it by the authorities. In September 2017, Pilato and five other activists staged a peaceful protest outside Parliament demanding accountability for the procurement of 42 fire trucks at a cost of 42 million USD. The cost of the trucks was widely seen as exorbitant by the general Zambian population. The procurement process was also questioned, resulting in a public outcry over alleged misuse of public funds. The six activists were arrested and beaten. They were later released on bail pending trial. The court appearances only began in 2018 and their pleas are yet to be recorded. However, since he fled the country, Pilato was not able to appear in court with fellow activists. As a result, an arrest warrant was issued in his name, it is being contested as having been issued irregularly. “Pilato is not a fugitive from justice. What he is facing is blatant and unfair persecution for speaking out against abuse of power,” said Muchena. “The song which was a major hit”?…ma reporters boza..